You can give your home a total style makeover by shopping for a solid wood floor in Ardmore, OK, from the collections in our showroom. A charming and elegant flooring material like hardwood never goes out of vogue. When you shop with our experienced team, you’ll get all the information and advice you need to make an informed choice. 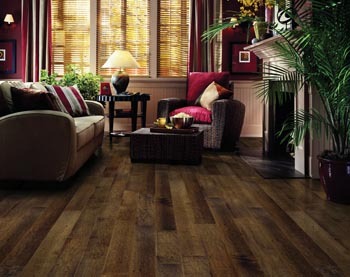 We always offer highly competitive prices on our vast inventory of wood flooring. When you have a wood floor installed you can greatly increase the appeal and value of your home. Wood floors are easy to maintain, and retain their beauty over time with minimal maintenance. You don’t have to wonder if it will last, because this natural flooring material is durable and strong. Dirt and dust are easily mopped away. It’s a smart flooring choice for allergy sufferers, because it does not retain allergens, and therefore creates a cleaner indoor environment. For style, strength, and durability, choose engineered floors that are made of plywood layers bonded with resin. Achieve the look of warmth and elegance with this cost-effective choice that also stands up to moisture. The results are ultimate durability. This flooring offers the luxurious effects of genuine hardwood flooring with the additional benefits of increased resilience. Ideal for bathrooms, a laundry room, or any other space that is prone to excess moisture or pooling. Excess interior moisture can make maintaining natural hardwood flooring a bit challenging so these floors are an ideal alternative. They are also ideal for high foot-traffic areas, such as kitchens and foyers. Always a beautiful aesthetic, wood flooring looks stunning as part of practically any design scheme. Our flooring experts are always ready to help you decide which species, grain pattern, or color suits your vision best. At our store, you can select your floors from an extensive variety of wood choices. With dark and light hues, as well as various wood grains to choose from, you’re sure to find what you want in our vast inventory. We cater to discerning consumers who want to strike that perfect balance between value and style, so we also offer remarkably reasonable pricing. Our customers have continued to choose us over the years because we offer outstanding quality as well as amazing savings. Dedication to excellence has built our sterling reputation. As one of the top name brands in flooring, Bruce is lauded for standing the test of time for its looks and workmanship. It has become the name that homeowners and contractors alike know and trust. Manufactured for more than 100 years, these strips and planks are of incomparable quality. Crafted from 100% solid wood, they are truly representative of quality flooring. Available in several different wood species types, we offer domestic and exotic kinds at various reasonable rates. Installing a wood floor is a process that requires a great deal of skill and experience. Trusting our professionals to do the job ensures the quality and performance of your new floors. We are ready to make your dream flooring a reality. Our hardwood flooring installations are designed to endure for years to come. With this strong and durable material, you can extend the life of your floors even more by even longer by performing minor tasks to maintain it over time. Our top priority is to provide you with the flooring that can transform your home into a cozy and inviting space or a powerful and modern one. Your home should be an aesthetically pleasing place for you. Our skilled and experienced installers can help you achieve your goal, no matter what sort of atmosphere you wish to create. Contact us to find out more about why wood flooring is the right choice for you. We proudly serve customers in Ardmore, Lone Grove, Dickson, Wilson, and Marietta, Oklahoma, as well as the surrounding areas.